Our New Bathroom Shutter is NOW available. Constructed to a matt finish our new waterproof shutters are ideal for the harshest of environments. Ideally suited for bathrooms, shower rooms, wet rooms, swimming pools and any other area likely to be in contact with water. The bathroom window is perhaps one of the hardest windows in the home to dress properly, you are often limited in the colours you can use, you are sometimes limited in size and shape and you are severely limited in terms of the materials you can use. Many of the materials commonly used to dress other windows of the house would perish in such harsh environments. With so much moisture around, the saturated atmosphere of a bathroom, shower room or wetroom would ruin fabrics like silk, cotton, wool and velvet, resulting in mildew, it would quickly damage any untreated wood causing it to rot and it would rust metal. 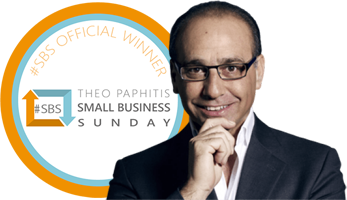 To overcome this problem, we are delighted to introduce our new and exciting range of bathroom shutters. 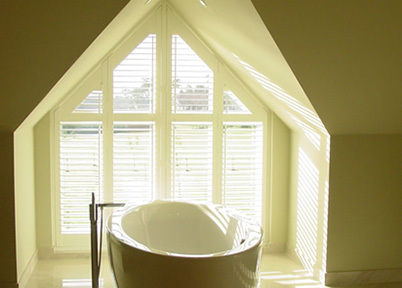 Specifically designed for bathrooms, shower rooms and wetrooms, these completely waterproof shutters make the ideal window covering for the wettest room in the house. Made from Acrylonitrile Butadiene Styrene (ABS), our all new bathroom shutters’ wipe clean surface, makes them ideal for any wet or damp areas in the home. Hard wearing and robust, our wetroom shutters and bathroom shutters are ideal for use in kitchens or any other room in the home that may be prone to large amounts of moisture. They are perfect for use as conservatory shutters, as indoor swimming pool shutters, as shower room shutters and as jacuzzi bath shutters. A feature of our bathroom shutters is that they are 100% waterproof. This means that even if they were fully immersed in water, they would remain undamaged. This ability to withstand wet conditions means that regardless of the amount of steam generated whilst you bathe or shower, your window dressings will remain unaffected. Our bathroom shutters are available in 6 different shades of white which compliment the clean, straight lines of the shutters. They are guaranteed to bring a fresh and contemporary feel to your bathroom or any other room in which you choose to install them. Like black, white goes with everything, so it really doesn’t matter what colour scheme you have in your bathroom, our shutters are going to match and compliment your décor wonderfully. 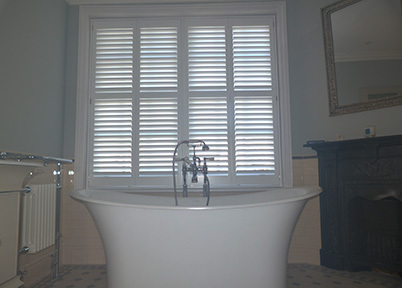 Our bathroom shutters can be produced in exactly the same style as our living, dining and bedroom shutters so, if you already have these installed in your home, we can produce the bathroom shutters to match. This will mean that from whatever aspect you view the house externally; your window treatments will be co-ordinated. Shutters are an extremely functional window dressing. They enable you to easily control the levels of light, ventilation, privacy and noise within a room and this is as true of the bathroom, as it is any other room of the house. Using shutters within the bathroom will enable you to regulate the amount of daylight or sunlight entering the room which is ideal, especially for those long, luxurious, romantic daytime soaks. The ventilation and privacy within your bathroom can be controlled easily too. You can have your bathroom window open to let in the fresh air and your shutters open just enough to allow the steam to escape without exposing the room or indeed yourself, to the gaze of any passers by. Noise reduction is another area where bathroom shutters offer an advantage to curtains or blinds. When closed they help to reduce noise pollution from the outside.